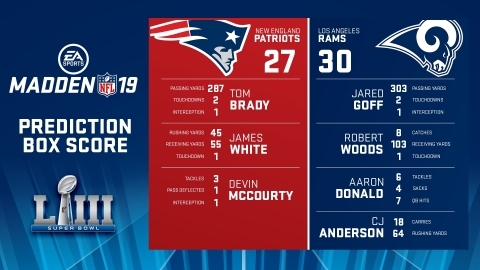 REDWOOD CITY, Calif.--(BUSINESS WIRE)-- Today, Electronic Arts Inc. (NASDAQ: EA) released the official EA SPORTS Madden NFL 19 Super Bowl LIII simulation, predicting a big win for the Los Angeles Rams as they walk away Super Bowl Champions and defeat the New England Patriots 30–27. Aaron Donald received the MVP award following a record-breaking Super Bowl performance in which he tallied four sacks. Madden NFL 19 is developed in Orlando, Florida by EA Tiburon and is available now for Origin on PC, Xbox One and PlayStation®4. For more information on EA SPORTS Madden NFL visit www.easports.com/Madden-NFL. Join the EA SPORTS Madden NFL conversation on Twitter and Facebook. The mark "John Madden" and the name, likeness and other attributes of John Madden reproduced on this product are trademarks or other intellectual property of Red Bear, Inc. or John Madden, are subject to license to Electronic Arts Inc., and may not be otherwise used in whole or in part without the prior written consent of Red Bear or John Madden. All rights reserved. All NFL-related trademarks, including NFL and the NFL Shield design, are trademarks of NFL Properties LLC. All team-related trademarks, including team names, logos, and uniforms designs, are trademarks of the respective NFL Member Clubs. All player participation has been facilitated by NFL Players Inc., the licensing and marketing subsidiary of the NFL Players Association (NFLPA). For more information about EA SPORTS games, including news, video, blogs, forums and game apps, please visit www.easports.com to connect, share and compete. At Electronic Arts Inc., we promise to treat your data with respect and will not share your information with any third party. You can unsubscribe to any of the investor alerts you are subscribed to by visiting the ‘unsubscribe’ section below. If you experience any issues with this process, please contact us for further assistance. By providing your email address below, you are providing consent to Electronic Arts Inc. to send you the requested Investor Email Alert updates.